With their primarily iron content, I have found these work well at the 1st Chakra for providing grounding and centering, especially in doing healing work on others. They also work well in promoting Spiritual growth at the 7th Chakra. Basically Moqui Balls are compacted sandstone which is encased in a "shell" of iron compounds. Some speculate they may have come from a meteor strike into sand. Others think they come from the iron concretions in sandstone where subsurface water has collected iron oxide around a nucleus of sandstone. Eventually these weather out into balls or what some call Moqui Marbles. The second explanation makes more sense geologically from the areas they are found in. Generally they are used for healing work in pairs holding the Female one in the right hand and the Male in the left hand. It's fairly easy to determine their gender energy by look. The Female stones are generally smooth and round, the Male are more oval shaped, flatter and have a rough surface. When doing shamanic journeying you may need some of your higher vibration guides to assist you. Moqui Balls assist you in overcoming any fear you may feel in this process. This includes any fear you may have in moving forward on your spiritual path. Their energy can also assist you in becoming aware of approaching of totem animals and spirit guides. I found using a piece of Scolecite further enhanced these capabilities. 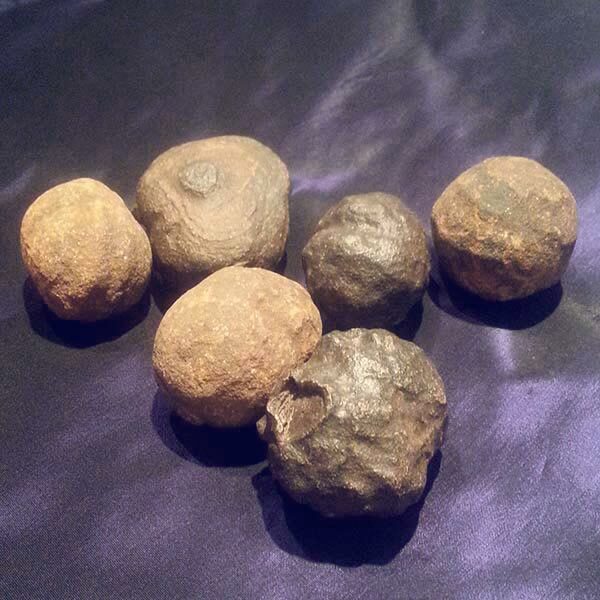 Moqui Balls are beneficial to all signs, their planet is Earth and they have Receptive and Projective energies. The children of the Indian tribe who lived in the Moqui Desert in Utah were known to play with these stones, particularly the smaller stones, and used them like children today use marbles, hence the name Moqui Marbles.